Maryland Gov. 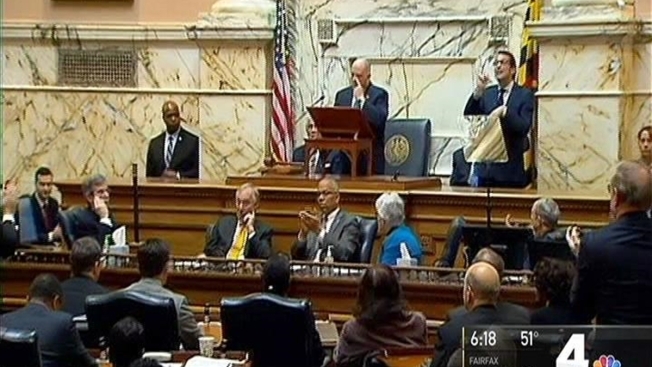 Larry Hogan highlighted economic concerns in his third State of the State speech. The Republican governor urged members of the Democrat-controlled legislature Wednesday to support incentives to attract jobs and help parts of the state that are struggling. He urged lawmakers to work together to provide tax relief to Maryland's retirees. Hogan said he'd like to get started by eliminating income taxes on the pensions of retired military, police, fire and first responders. And Hogan called for compromise on proposals to require paid sick leave by considering the needs of Maryland employees while not hurting small businesses. The governor also underscored the need to do more to fight opioid addiction. He also called on lawmakers to bring his legislative redistricting reform bill up for a vote. Hogan used the speech to urge the repeal of a law he calls the "road kill bill." He feels the Democrat-controlled legislature passed the law last year to stop him from proceeding with the highest priority transportation projects across the state. "On behalf of the people of Maryland, please do not stand in the way of these critical transportation infrastructure projects," he said. "Let's repeal this misguided, poorly drafted and fatally flawed road kill bill." Transportation and easing Gridlock is something Democrats were hoping to hear more details about in the address. "We didn't hear a lot about how he would help our overcrowded areas, especially in public transportation, like we get in Montgomery County, Prince George's County, Charles County or Baltimore City,"said County Executive Rushern Baker (D-Prince George's County). State Democrats noted Hogan didn't once mention President Donald Trump and administration policies that will affect the state. "Nearly 500,000 Marylanders are at risk of losing their health care due to the repeal of the Affordable Care Act," said State Sen. Richard Madaleno (D-Montgomey County). "It would have been nice for him to talk about what the state is going to do in that eventuality." But Republican leaders said Hogan's address set the right tone for this legislative session. "I think the governor is right not to drag partisan politics into this environment, and I encourage members of the Democratic Party to resist it as well," House Minority Leader Nic Kepke said. Hogan repeatedly said lawmakers achieved a lot in the past two years, but he ended by saying they can and they must do more.